Keeping harmful vapors out of a building is a unique application for geomembranes. Layfield can help you design a vapor management system and show you how a combination of geomembrane barriers and vents can keep vapors out of your building. 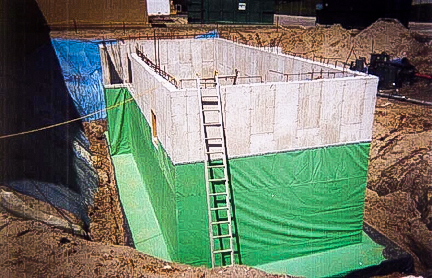 We regularly install under-building liners for methane and contaminated soil sites and have materials available to prevent infiltration of moisture, methane, hydrocarbons, and other contaminants. Integrating a geomembrane underneath (or on the walls) of a building is a very complex task. The best geomembrane solution is a material that is flexible and that can adapt to the details of a building foundation. Our HAZGARD 100 is ideally suited to under-building liners and is methane and hydrocarbon resistant. Drainage media are also important aspects of building liners and we have a number of prefabricated drainage (vent) materials available to address this requirement.